Taken by the Columbia River, at sunset. There really isn't much I can say about this shot. It's simple and lovely. The DOF really works here in my opinion. I like how the focus is in the front and on the orange stone, and how the backgroud is just that. Background. Nothing distracting in the background, and it's blurred nicely. The lighting is really excellent. I think that is what makes this photo for me. There is shadow on the 'dull' rocks, and then the orange stone just jumps out and says 'hey, look at me'. I like the little reflection of the sun in the orange stone as well. The small patches of light throughout the shot are really nice. Focus on the stone is excellent. Nice clarity and detail in the stones. I like how we can see the texture in the rocks. I see nothing that i'd like to see differently here. It's a great shot. 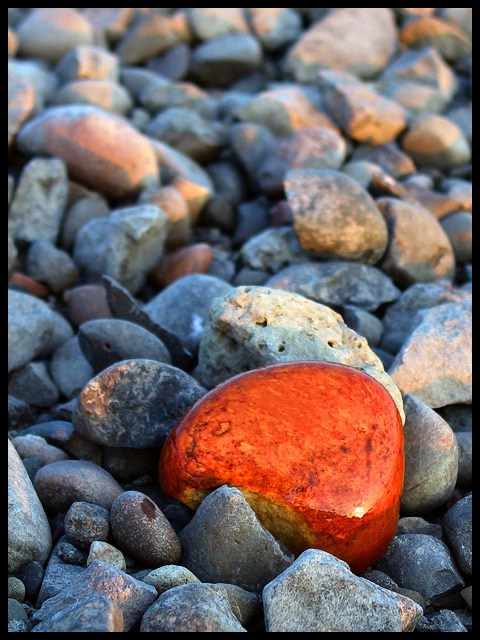 Orange stone, nice subject and shot. I like the how the muted colors in the photo really make the orange stone stand out. Great focus. True beauty, good sharpness and colors. Well seen. An effective shot. I wonder if it would be more effective with greater DOF in the background? Proudly hosted by Sargasso Networks. Current Server Time: 04/19/2019 01:04:11 PM EDT.